Staying on the topic of bedrooms, I wanted to explore some of the latest bedlinen designs and see what some of the designers are up to when it comes to creating an inviting place to rest your head. My personal choice when it comes to bedlinen is choosing the highest thread count you can afford, however sometimes it may come down to a design you fall in love with. One thing I will say though, is make sure you purchase 100% cotton whether organic or not, or choose a linen/cotton mix, or 100% linen. Polyester/cotton mixes may be easier to iron than pure cotton or linen, but they will make you hot and sticky in summer and they just don't have the same wonderful feeling that freshly ironed cotton sheets have against one's skin. Above: Blue and white is a personal favourite. This Mimi Paisley design from Pottery Barn, it is a modern twist on paisley and the bonus is that they have used 'organic' cotton. A great design for the beach or city pad. 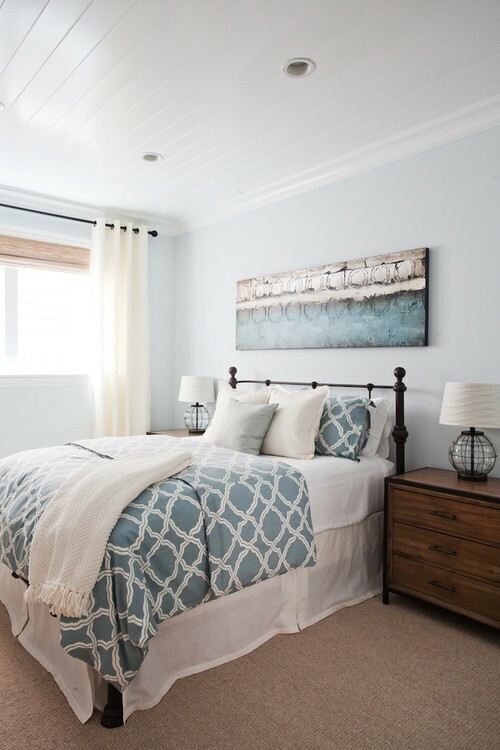 Team this duvet with crisp white sheets or blue and white striped sheets for a fabulous look. Above: I chose this pretty, organic patchwork quilt as I love the combination of colours. Duck egg and lemon mixed with bright and dark floral patterns. It is reversible to a solid blue. Organic and hand made, I think a quilt like this would look gorgeous folded at the end of a bed, adding a country feel. 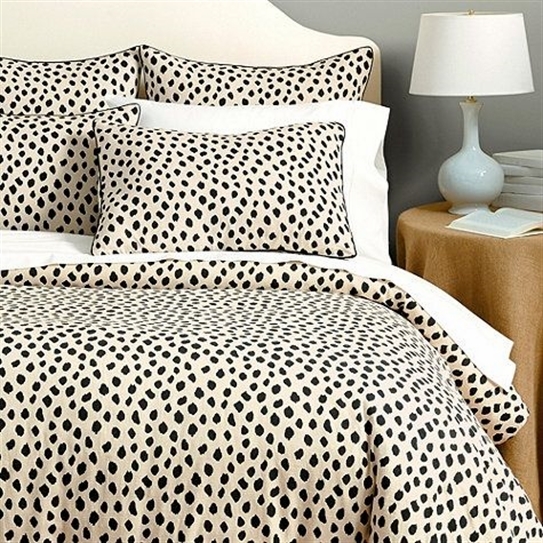 Above: I love animal print and Ballard Designs have taken inspiration from the leopard for their Dodie Animal Print bedding. It is 100% cotton with a slightly slubby texture. It comes in black, natural and spa. 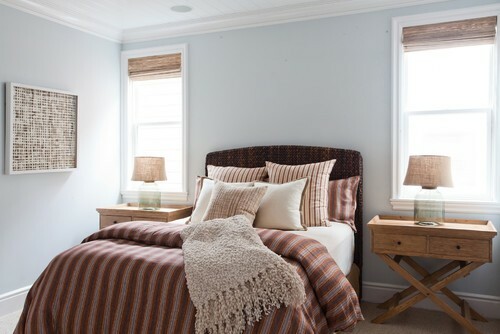 It would look fabulous mixed with stripes and for winter you could incorporate a gorgeous faux fur throw. A few textured cushions would complete the look. Above: Stripes are always popular and this vintage ticking stripe from Ballard Designs has been around a little while. I think it is classic and suits most interior styles, French, country or coastal. You can choose from navy, black, sandalwood or spa. 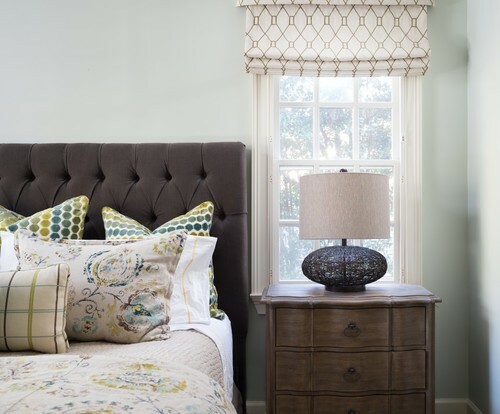 I like the tassel detail at the end of the bed. Team it with florals to soften the look. 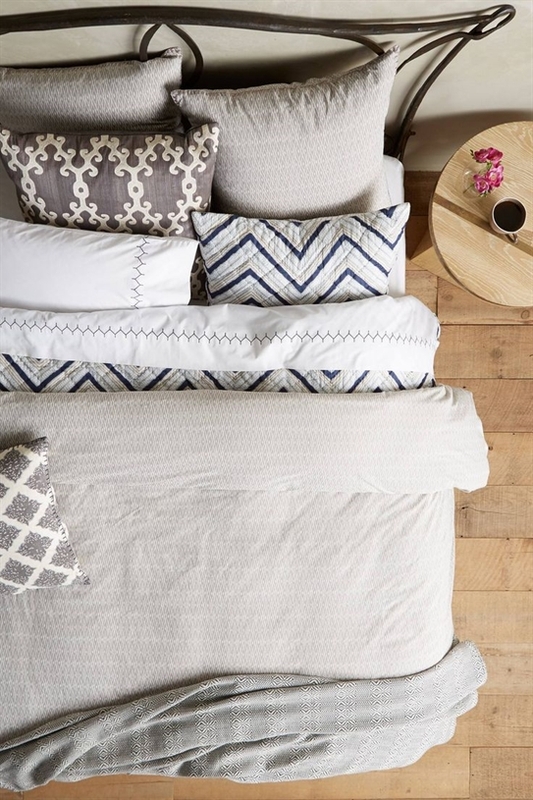 Above: I couldn't resist the Sukumala Berry duvet from Designers Guild. A new twist on Ombre. I don't think this setting does justice to the design, it would look fabulous in a Moroccan style bedroom mixed with some rustic furniture. This design in on special at the moment at a fantastic price so if you like this style, you can use the link to find the sale. If you are thinking of changing your bedlinen, have a look at some of the links beside the bedlinen above as you will find many more ideas. I hope everyone has a lovely weekend wherever you are in the world. I am looking forward to spending some time next week with a dear friend so I will be taking a break from the blog for the first half of the week. 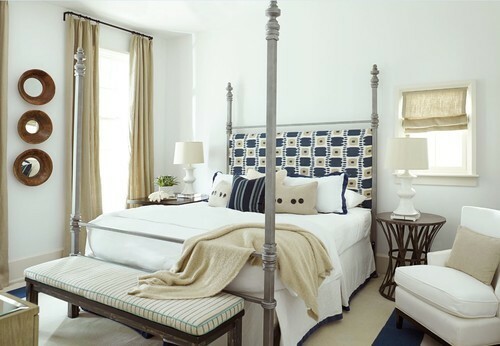 Hi Lee Love ALL these bedrooms, but particularly the Pottery Barn (you know me - sucker for blue) and oh my the bedding and room of Palm Design group - sigh!